On the federal level, the issues tend to be fairly broad. There is no direct taxation of cannabis at the federal level, so the issues turn on how cannabis is treated differently from any other business. Effectively, the federal government has wavered in how it treats cannabis, from respecting states' rights to determine legality to treating it as an illegal narcotics trade. On the state level, over the past few years, a large and growing number of states have expanded the legality of marijuana or cannabis, some continuing to keep it as an illegal narcotic, some allowing it for medicinal purposes and some allowing it for recreational use. As with a broad spectrum of legal treatment, there comes a broad spectrum of tax treatment, with each state that allows some limited or unlimited use of cannabis enacting tax provisions that are all different. 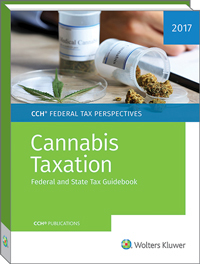 Cannabis Taxation: Federal and State Tax Guidebook serves as a comprehensive source of coverage to the disparate treatments of cannabis taxation across federal and state jurisdictions.